There is no greater and more respectable job than serving your country. It is a truly admirable devotion when people join the military. It is more than just a career – it is a lifestyle. The military fosters the development of leaders and strategic thinkers with a high level of discipline and loyalty. Bison recognizes and values this commitment to excellence, making it an ideal place to start the next phase of your career. Bison celebrates the achievements and accomplishments of men and women in uniform. Following a commitment to the military, Bison welcomes veterans and encourages them to become part of its family. Skills developed in the military are in high demand and are transferable to several career paths at Bison. Headquartered in Winnipeg and with terminals in Langley, Edmonton, Calgary, Regina and Mississauga, military stripes from coast to coast to coast are encouraged to consider a civilian career with Bison. David Cartwright served 30 years in the military and reached the maximum time you can serve. He was released in 2012. Through deployments in Cyprus and Bosnia, Cartwright served as a tank commander and a member of Lord Strathcona’s Horse (Royal Canadians) (LdSH(RC)). 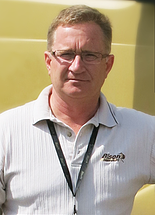 Cartwright began his career at Bison as a turnpike driver and now plays an integral role in our Edmonton operation as the terminal lead. And Cartwright has experienced how Bison is a great fit for military personnel. Indeed. Bison is committed to making the transition from a military to a civilian career as smooth as possible by matching the skills you’ve gained through your years of service with an ideally suited career path. Bison has numerous driver, maintenance, warehouse and office opportunities for former military members and veterans.